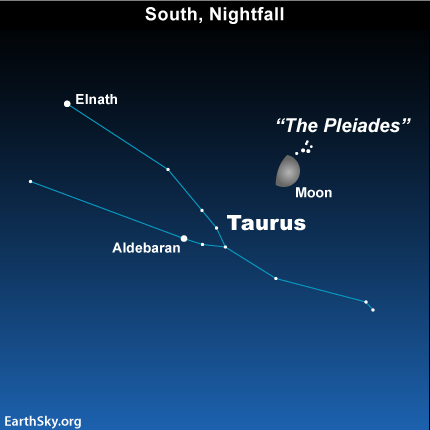 The waxing gibbous moon shines close to the Pleiades star cluster tonight. 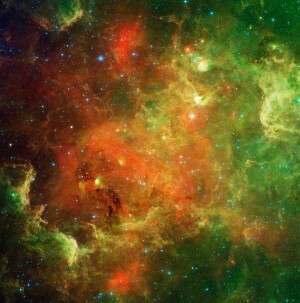 This cluster is also called the Seven Sisters. Because of the moonlit glare, you might need binoculars to see the dipper-shaped Pleiades cluster. As seen from North America, the Pleiades sit to the west (right) of tonight’s moon. As seen from mid-northern latitudes in Europe and Asia, the Pleiades sit to the moon’s east (or left). It’s the same moon, and the same sky, but – by the time we in the Americas see this scene – the moon will have moved from one side of the Pleiades to the other, as it travels in orbit around Earth. The Pleiades star cluster is an actual star cluster in space. However, in the mind’s eye of the early stargazers, it marked the shoulder of the Bull in the constellation Taurus. To the east (left) of the Pleiades star cluster, you will find the Bull’s brightest star, red Aldebaran. This star is said to represent the fiery red eye of the Bull. Tonight’s moon is gibbous – or more than half lighted but less than full – but it is only slightly gibbous. Tonight, we are seeing a little more than half of the moon’s daytime side and a little less than half of the moon’s nighttime side. The shadow line running across the lunar disk is called the terminator. It is along the terminator that you have your best views of the lunar landscape with binoculars or a telescope. The intermingling of light and shadow along the terminator line gives a wonderful three-dimensional portrayal of the lunar mountains, craters, and valleys. The best time to look is around sunset, before the moon appears too bright against the dark night sky. When the moon is waxing (increasing) from new to full, the terminator shows you where sunrise is on the moon. 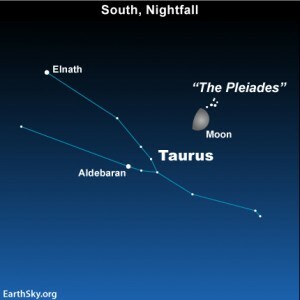 Look for the Pleiades star cluster close to the moon. Although most people can only see six Pleiades stars on a dark, moonless night, the Pleiades cluster is nonetheless called the Seven Sisters. Remember, if the bright moon makes it difficult to see the Pleiades’ dipper-shape pattern of stars tonight, try using binoculars.